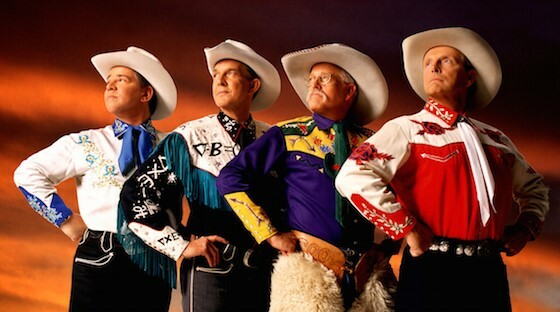 Franklin Theatre - King of the Cowboys - Riders in the Sky Salute Roy Rogers - SOLD OUT! King of the Cowboys - Riders in the Sky Salute Roy Rogers - SOLD OUT! “King of the Cowboys - Riders In The Sky Salute Roy Rogers” is a 90 minute multi-media romp featuring audience-friendly favorites from Roy’s long career that include “Don’t Fence Me In,” “Pecos Bill,” “Happy Trails” and more, all appearing on the Riders’ latest album saluting Roy Rogers, and wrapped up in Riders’ two-time Grammy-winning high yodeling style. Ranger Doug, preeminent singing cowboy historian, provides some biographical fun facts about Roy’s life, from his humble beginnings as Leonard Slye from Duck Run, OH, to one of Hollywood’s most beloved stars, and his influence on a generation of musicians and western entertainers.